Our passage from Tuvalu to Vanuatu did begin promisingly on Thursday 30 July with a bright and fair morning. We set off across the wide lagoon from Funafuti to the western reef pass with the sun behind us, showing clearly the colour palette of the lagoon – darker blues and greens were safe, deeper waters, but bright turquoise indicated shallows. As we neared the barrier reef these bright patches became more noticeable, and beyond, the brown spots to be avoided, where the coral lurked just below the surface. Unlike the southern pass we had entered just a week earlier, this passage was not buoyed, so I was glad of the help of the sun to guide us through. A grey day would have made our lives much harder, especially with Drina’s depth sounder on the blink. The Danish yacht which arrived just after us had already weighed anchor and was heading through the southern pass, on a delivery trip bound for Tarawa. No Regrets were just behind us, leaving the anchorage empty of yachts. I doubt there will be many more this year. The seas were relatively calm so barely broke white on the reef, and I strained to see a safe path through. Michael had been this way several times before. ‘Look, it is there,’ he said, pointing, and I saw then the darker, deeper way through. There are only a few tiny islets on this side of the lagoon, all with their thick tufts of palm trees – except for one, which was quite denuded, a low strip of yellow sand and nothing more. I wondered if this was the islet that had lost all its vegetation when Cyclone Pam caused havoc some few months earlier. Out into the sea we came safely, and set our course westwards. I watched as over the next hours the last signs of Tuvalu disappeared below the horizon, wishing I could have stayed longer. The seas were light and the wind behind us: after a good 24 hour run it looked as if the 800 miles to Vanuatu would pass quickly. ‘Could be there by Tuesday,’ remarked Michael. 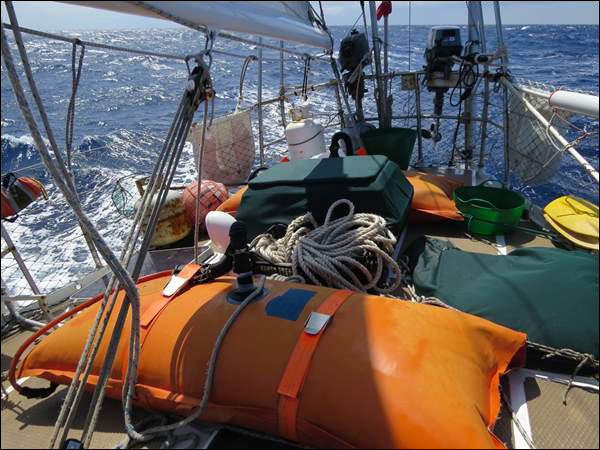 ‘Only a few more days.’ I grinned at Dan, who was suffering badly from seasickness, pinned to his bunk as usual. He smiled wanly back. Michael updates the ship’s log. The weather maps and forecasts we received daily by email showed something ominous: the low we’d hoped would dissipate was intensifying, its eye located right between us and our destination. ‘I really hope that doesn’t turn into a tropical cyclone,’ said Michael. Although we were well out of the cyclone season, tropical depressions can form at any time. I hoped fervently that Michael would be proved wrong. 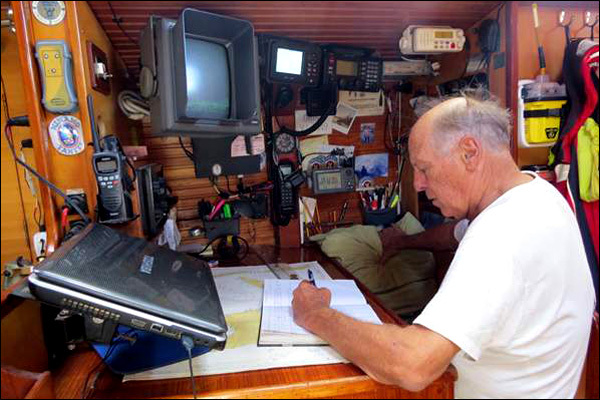 He’s been sailing the Pacific for fifty years, as master mariner, ship’s pilot, racing and cruising yachtsman, so he knows his stuff. Although the forecasters weren’t sure where this low was headed, at least there are some things you can predict. In the Southern Hemisphere, the depressions always circle clockwise (anti-clockwise above the Equator), with the winds intensifying in the south-western quadrant. That’s the one to avoid. We were up north, on the edge of the northeast quadrant, in what is termed the ‘navigable semicircle’, where the winds are always lighter. Caution dictated Michael’s tactics, and as storms rarely track above 10° South, we headed north hoping to get out of harm’s way. Dan was less than amused as we first changed course to head away from our destination, and then downed sails and drifted. ‘Will we ever get there?’ he moaned. Seems I haven’t managed to make sailors of either of my children, mores the pity. I felt at times pretty sea sick myself, though I got my sea legs eventually. Dan researches his trip to New Zealand and Hobbit film locations. As we drifted bare poled all of Friday night and into Saturday and Sunday, I was reminded of that famous verse from The Ancient Mariner. I hoped there was no curse upon us. The current was in fact in our favour, pushing us gently in the right direction at the rate of about a knot. At this rate, we would eventually get there… (groan from Dan). Orange tanks on deck keep Drina well supplied with extra fuel if needed. Stronger winds, drifting, wallowing about – days and nights get mixed up. There is little to see out here, a few fishing boats, night skies lit up by lightning. A solitary storm petrel winging confidently over the waves, one delicate little leg dangling into the water as is their habit. Michael calls the petrel ‘Mother Carey’s Chicken’: they only appear during high winds. Gone before I can reach my camera – I am trying to get photos of sea birds for the program that we run with SeaBC, but there are not that many of them, and they don’t stick around for long. 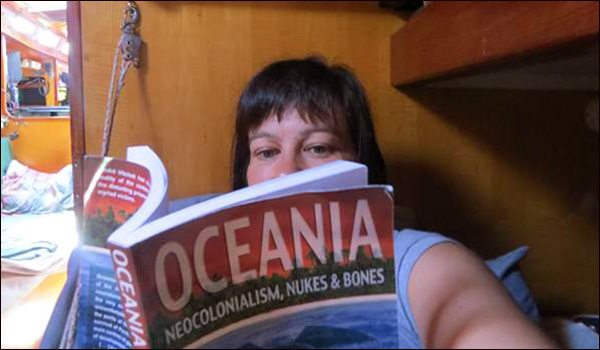 Time to catch up on reading! The weather files show the low is definitely weakening, so on Wednesday we start heading for Santo. No Regrets have followed a similar path to us, and have already turned back on course. The wind has shifted to the South East exactly as predicted, which means we can sail but progress is slow. After days of sweltering down below the air is noticeably cooler. ‘That’s because it’s a south wind,’ explains Michael. He’s an Australian so that makes sense to him but I feel like a real Northerner at this point because where I come from the south means heat not cold. I remember Antarctica and the great Southern Ocean is down there, below us, and pull on another layer. It feels as if every individual mile of this voyage west had to be wrested from the ocean. I think back to the 28 days it took to cross the Atlantic with my family in 1976. We had so many long passages! So this isn’t anything to boast of. 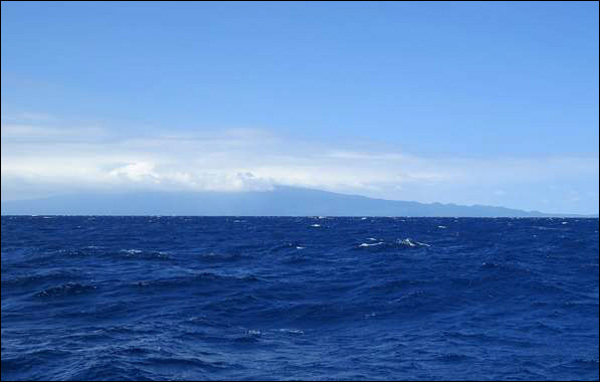 Finally, at first light on Saturday morning, off the port bow is a dark smudge of high land – Maewo Island. Only another 60 miles to go to Espiritu Santo. The wind and current are against us. Just a little bit more effort. 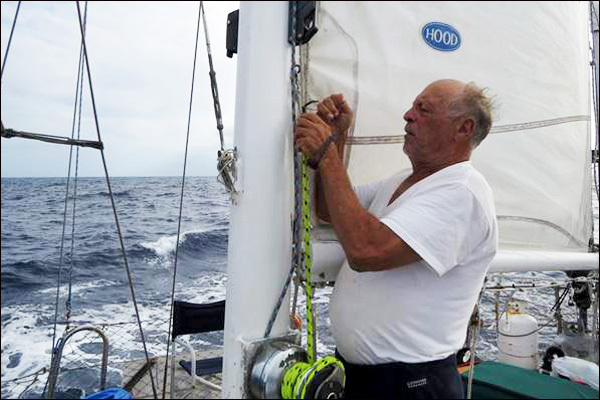 Sailing in the tropics – what a breeze, eh?